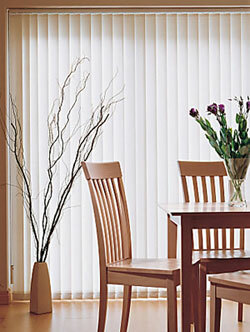 Enquiries will be passed to another outlet in Doncaster known as Danum Blinds. The showroom is situated at 1 Harrington Street, Doncaster. Opening hours are 9.30am to 5.30pm Monday to Saturday. or email via this website. We are a small local business, run by a husband, wife and retired father team. We have many years of experience in the industry, both manufacturing and fitting vertical blinds. All our blinds are made to measure and the Vertical blinds are manufactured on site. We can also supply and fit Venetian blinds (both wood and aluminium), Roller blinds and Pleated blinds. We offer excellent customer services and are a local friendly, family business offering quality products at a very competitive price. Our showroom is located at 31 Market Street in the town centre - close to the new Marshalls Yard shopping centre. Our opening hours are Monday-Saturday 10am-3pm. Call or email today to book your free no obligation quotation! Everything is brought to you, the customer, to view in the comfort of your own home. If you prefer, call into our showroom, where we will be more than happy to help you. Our business to present has been through personal recommendations and repeat business.